Myself and my partner sadly suffered a miscarriage in 2009 then a further two more in 2009 and 2010. This was such a heart breaking time for us and our family. Family and friends were very supportive but no one knew what to say to help us get through this awful time. We were given a leaflet from the hospital and I logged on to your website. I found support and help from people who had been through the same. 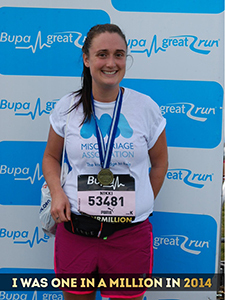 I decided to run the Great North Run to help raise awareness and funds as its not something that is talked about often. It was an amazing day and I managed to raise money for this amazing charity!